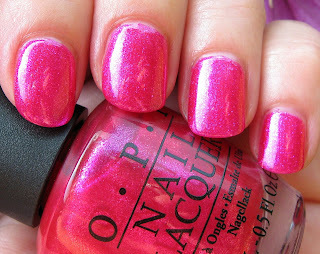 OPI's four piece Nice Stems Summer 2011 Collection is surprisingly versatile and on-trend, considering that it's a collection of pinks. This little set has me rethinking why I seldom wear pinks. It seems there are so many other shades that have made their way to the front of the nail polish line, that the once all too common pink has been set aside in favor of those more fashionable colors. This collection might just turn some of us into pink lovers again! Come to Poppy, with it's catchy name and bright pink coral hue, is probably my favorite shade in this collection. The micro shimmer flashes shades of primarily bright pink, and it has a pearl shimmer finish. The formula was on the thick side, but it applied nicely and was almost opaque in one coat. The photos below are shown using two coats, and were taken outside in the shade (top) and in full sun (middle). Rather than show I Lily Love You--the glitter shade--on its own, I layered it over the other three shades. That look is the last photo in each group. The sheer pink jelly textured base doesn't work alone without multiple coats, so I prefer this multi shaped iridescent glitter as a layering top coat. 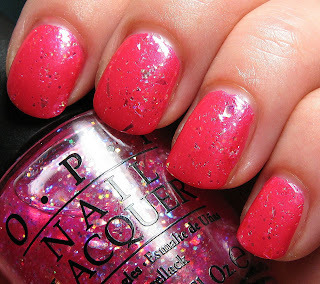 Play the Peonies is also a pearl shimmer finish that is the palest of pinks. This shade has micro shimmer in the same shade as the base color, and appears more pearly off white than pale pink in bright sunlight (below). 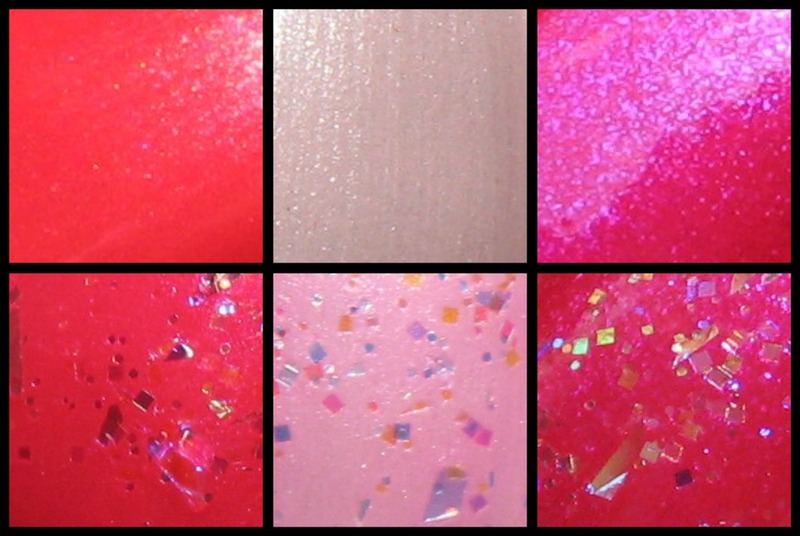 The middle photo was taken under an Ott lamp, and you can see more of the subtle pink shade. The formula on this shade was quite thick, and I had more than a few streaks after the first coat, which isn't unusual for this type of shade. A second coat gave it the look shown in the photos. I Lily Love You adds a Funfetti look in the last photo. 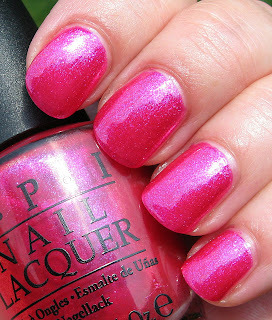 Be a Dahlia Won't You is a foil micro shimmer with blue flash. I had no problem with the formula and although thinner than the others, I was able to get an opaque finish using two coats. I'm sure I have other bright fuchsia shades with a similar finish, but this is a favorite color/finish during the summer months for me. This shade has a super high gloss finish, and topped with I Lily Love You is a beautiful combination that didn't photograph as pretty as it is in real life. I am very happy with this little collection! The gardener in me adores the theme and the names, and I now have a renewed love of pinks. 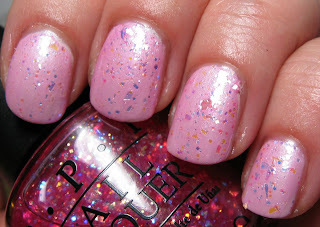 I Lily Love You has endless possibilities both over and under other polishes with it's variety of color-changing multiple shaped glitters, although I guess it was wishful thinking that I could wear it by itself and be satisfied with the look. Did you pick any shades up from this collection? Let us know how you feel about pinks in general! Ahh, I want these! I've been obsessed with pink lately and these are right up alley. Thank you for the swatches! I am REALLY digging Come to Poppy and I Lily Love You. Am patiently waiting for these to come out near me! I got the entire collection. Come to Poppy is such a fun shade and although I'm not a pale fan, Play the Peonies is gorgeous along and with ILLY. I haven't worn Be a Dahlia yet; I have a wedding to attend next weekend and was thinking of wearing Wing It from last year. Perhaps I'll use Be a Dahlia instead :). ahhh I love them all!! Each and every one!! 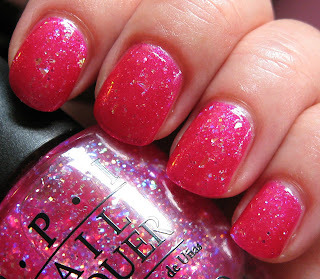 I love this collection, especially the bright pinks & glitters. Hope it comes down to Australia! I love this collection. Such diffeent shades of pinks! Love that glitter topcoat. wow, lilly I love you is so damn pretty! I do like the other shades too, but that one is extra special! I'll have to buy this collection! I found them at my local store but I wanted the mini set...I still have to wait a little! The 4 of them look gorgeous! i like i come to poppy with i lily love you. good color! Love Come to Poppy! Beautiful summer shade.